The highly anticipated second season of the BAFTA award-winning Danish political drama Borgen will be released as a DVD and Blu-ray box set on Monday 4 February, 2013. 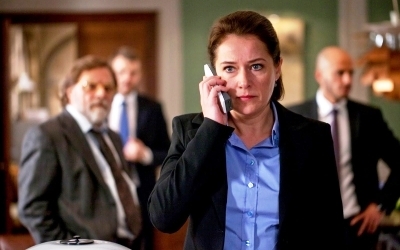 One of breakout series of 2012, Borgen achieved record-breaking ratings for a Nordic series debut when it first aired on BBC Four back in January 2012. To celebrate this release, we’ve kindly been provided with THREE DVD copies of the Borgen Series 2 box set to give away to our loyal readers, courtesy of our good friends at Arrow Films. This is an exclusive competition for our Facebook and Twitter fans, so if you haven’t already, ‘Like’ us at facebook.com/CineVueUK or follow us @CineVue before answering the question below. In Borgen Series 2, Birgitte Nyborg (Sidse Babett Knudsen) has been Denmark’s Prime Minister for two years years that have taken their toll on her private life. Politically, she has succeeded in earning the respect of both her political allies and enemies, but tensions between parties are mounting. Denmark’s participation in international wars, as well as certain central domestic policy issues, are driving a wedge through the parliament and Birgitte is increasingly finding herself having to make shaky compromises. Who is the creator of Borgen? Borgen Series 2 is released on DVD and Blu-ray from 4 February, 2013, courtesy of Arrow Films. The competition closes at 6pm on Thursday 7 February, 2013.